I have this file for about a month ago while there was still waist part available. Because I can't edit it to add a cover on it, I never release this part. I was still waiting for editable parts to come to my mailbox. 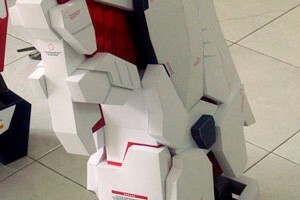 But now I've change my mind, I decided to release this Unicorn Gundam Jetpack 5x bigger template. This file was submitted by Petr Ježek. I have this file several days ago, I finally got the time to upload it today. This is the leg part for Unicorn Gundam 5x bigger. Resized and layout done by Syarifdigas. He also created additional instructions in the RAR file. He use Coreldraw to edit the original file. Almost all Paper Replika's template can be edited by using that vector image editing / designing software, simply by dragging the PDF file onto Coreldraw workspace and enter the usual password. Most of the parts in the template have to break into several parts, Syarifdigas has added alphabet signs as assembly guide. It works like this : in the same part number, combine egdes with the same alphabet, a with a, b with b and so on. In my calculation this Unicorn when completed will has about 2 meters in height. In this post I also want to inform you there is a mistake on arm part (page 33) and you can re download at the arm part post. I am still judging for AR Drone Paper Model Contest while Jodi tagged me on his photo in Facebook. He finally complete his new diorama paper model, it is a diorama of an alley in Tunisia. Jodi has captured this World War II at Africa front battlefield, Tunisia. He was inspired by a scene in Call of Duty 2 game. He made this diorama suitable for 1/35 plastic figure. This release also marked his first work on his brand new site, Dioramau. The contest officially closed on July 18 00:00 GMT+7 today. We have 23 contestants (updated) who already submit their designs on recoloring AR Drone 2.0 indoor and outdoor hull. Some of them submitted two of their creations. 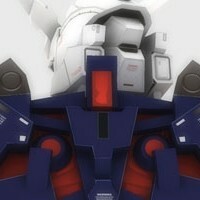 Due to misunderstanding about when does the contest closed, because of different time zone even though I already said it on the contest description, we give you one day more to complete your paper model built and take the photo then submit it before July 19th 2012 00:00 GMT+7, or tomorrow midnight. Also for you who want to resubmit your drone photos please do so. The winner will be announce on Thursday July 19th 2012. 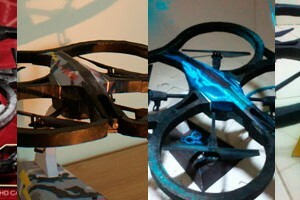 All custom drones that are submitted are beautiful, it will be hard to judge who will be the winner. 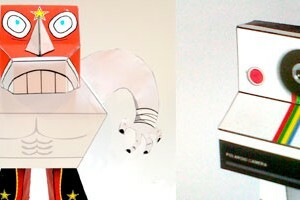 Two new paper crafts from Bamboogila Corner, they are Rinoceronte Lucha, a wrestler character with artistic mask that Christopher created from his imagination and a two legged Polaroid Camera paper craft. Christopher onced had a Polaroid camera when he was a kid but lost it when he and his family moved from abroad. That memory inspired him to make this cute personalized limbed camera. Both paper craft are very simple, the camera only one page and Rinoceronte Lucha two pages. Both paper crafts assembled by Ophieck (PERI).